Every roll of Red Brand fence has a tag attached to it. This tag indicates the fence design, the ID of the employee who tested it for quality, the date of manufacture, and the style number. With 15 different fence styles, we already offer a broad range of fence types. Now, add in different gauges, knots, galvanization classes, roll lengths, and wire spacings. The result is nearly 200 unique Red Brand fence styles. 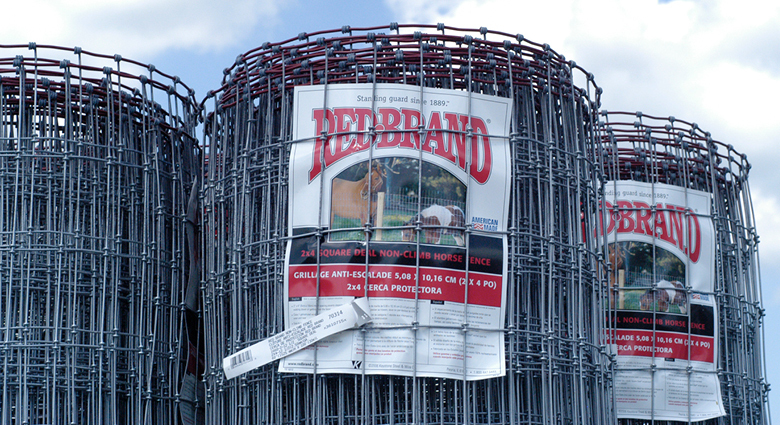 With so many designs, Red Brand is sure to have a product for every fence project. When reading a style number, the first part of the number tells you how many horizontal line wires are in the fence. Therefore, in our example, 10 means that there are 10 wires from top to bottom in this fence style. These wires extend horizontally across the entire fence roll, and depending on the type of fence, are either welded or woven to the vertical wires. Rather than searching for a tape measure, just look at the last two numbers in this set, which represent the roll’s total height in inches. From our example, this roll is 47 inches tall. Paying attention to this number is critical with multi-use fence designs. While a 4 foot fence is perfect for protecting a garden from rabbits, it isn’t recommended for a large dog kennel. If you plan on fencing animals that are larger and need more space, be sure to look for style numbers with a higher second set of numbers. A quick glance at the actual roll of fence will reveal the horizontal spacing from top to bottom. In some cases, the fence features a uniform distance between each of the horizontal wires. But for other fence styles, the opening gradually becomes smaller and smaller toward the bottom. The “middle” number represents pull-out. This is the measure, in inches, of the distance between the vertical wires. In our example, the number 6 tells us that each vertical wire is spaced 6 inches apart from left to right. While this number doesn’t affect the roll’s height or length, it’s critical in determining its strength and weight. A fence with more vertical wires will result in less sagging and maintenance, providing increased protection. Referring to a fence style tag is the fastest way to identify the best roll for your project. The next time you are shopping for fence, simply compare different rolls by their style number to select the perfect fence. Before you head to the store, you can download and print Red Brand’s Quick Reference Guide. This handy fence guide includes tips on Reading Fence Style Numbers, Wire Gauge, Fence Knots and more.